During my first year teaching middle school students, I found myself in a bit of a dilemma. When the bell rang, I knew that my class should be orderly and on task. But it simply wasn’t. In fact, it was often a bit of a disaster. I had an activity on the board for the students to complete, but no one did it. Instead, they just kept chatting and laughing. Now some teachers have a natural air of authority and a voice that commands respect, but I do not have those gifts. I cannot (and will not) raise my voice loud enough to be heard. In fact, I often struggle with losing my voice altogether. Moreover, I knew that even if I could get their attention that way, I didn’t want to have to yell for class to come to order each day. I had repeatedly told them that this behavior was unacceptable, but I wasn’t following through with anything, and I wasn’t sure what to follow through with. With half the class talking, I wasn’t about to give them all detentions. Eventually I went to my mentor teacher, and she gave me the following idea: When the bell rings, calmly walk to the board and start writing down the names of everyone who is talking. When they notice, tell them that each student with their name on the board now has a warning because they were talking after the bell. If they speak out of turn again during the class period, they will receive a discipline essay (or whatever penalty is appropriate at your school). Well, this seemed a bit juvenile to me, but I tried it, and wow did it work wonders! The First Days of School by Harry and Rosemary Wong explains how to make this method work on a regular basis. I tweaked their plan to fit my situation and soon had a surprisingly effective discipline tool. Here’s how it works. Watch carefully for the very first person who talks and be sure to give him a warning in the form of his name on the board. This shows right away that you mean what you say. When you give the first warning, say something such as, “Taylor, you see I’m putting your name on the board. Remember that talking is not permitted and that this is just a warning to you that you were talking and that you need to stop. You are not in trouble at this point, but you will be if you continue to talk without permission.” This shows the class that you are not demeaning the student and that he isn’t yet in trouble but that he is being warned to correct his behavior. From then on, simply walk to the board and write down the name whenever you need to give a warning. The student is warned, the incorrect behavior ceases, and the flow of your teaching is not interrupted. So what happened when I started writing names on the board? The level of talking decreased dramatically, students were more on task, and I was less flustered. In addition, I found that I hardly ever actually have to give out any discipline. I probably give out consequences for talking only about ten to fifteen times in an entire year. Having a visual warning serves as a deterrent and helps students get back on track without my actually having to hand out many punishments. Please note, however, that you do need to be ready to hand out the penalty when a student gets too many warnings. Otherwise, the students will quickly see that you don’t mean what you say. This method made the biggest difference at the start of class. There would still be days when the bell rang and half the class was still talking, but instead of allowing my stress level to rise, I would calmly walk to the board and start writing names. It didn’t matter if I got everyone because it normally only took three or four names for the class to notice. Then they would quickly quiet down and get to work. What a better option that is than yelling! Now the obvious downside to this method is that it seems juvenile. Elementary teachers, you have no problem there. For middle school, yes, it seems juvenile to me, too, but I can’t believe how well it works! If you teach high school, sub, or are just not crazy about putting names on the board, look for ways to modify this method. For example, you could give a student a warning by putting a post-it on their desk. Of course, you’d go through a lot of post-its, but it should work as effectively. Class Dojo is another great option. The key is that you 1) personalize the warning to the student and 2) don’t interrupt your flow of teaching. This method may not be a good fit for everyone. But if you’ve had trouble keeping order in your classroom, I do highly recommend that you try it. For me, it was a miracle worker. And if you’d like some help implementing this idea, get my free video mini-course that will walk you through how to turn things around mid-year and regain control in just 3 days. What methods do you use to keep control in your classroom? Share them by leaving a comment. It is a bad idia! Calling for silence we suppress the ability to learn. Students should be encouraged to be active in the classroom! If the students don’t hear the directions, or all the activity is off task, what is being learned? I do agree that students should be actively engaged in what they are doing, and this often means talking and making noise. However, we need to focus that energy, rather than letting it run wild, which means every now and again students need to be quiet and let their teacher speak! I agree as long as the talking is related to the lesson. You clearly aren’t a teacher. But there is an element of respect when the teacher is speaking the students should be quiet and listen right? They SHOULD, but how many kids do you know who actually do what they should all the time? I’d like to meet their parents & find out what magic pill they used! Didn’t remember to use it until my afternoon classes though. My class immediately after lunch is HORRIBLE. Only 27 kids, which probably sounds great to some, but one of my most crowded classes. I have one empty desk, so I have tweaked and re-tweaked the seating chart trying to find a way to seat everyone without the problem students being able to interact. There are about 5 boys in there who cause problems. I have tried other methods with them, and have had to give a couple lunch detention. I hate doing that bc they need that time to run off energy, but that;s all I’ve got. :/ This got their attention. I did have to follow through with detention for two sadly, but hoping this method continues to work. End of the third week, the students should be used to routines and procedures now, so there were several teachers who decided it was time to crack down. I am on a long-term sub assignment (Newly certified teacher, but 20+ years of teaching uncertified) so I have hesitated to change the teacher’s layout of desks, however, I observed the layout of my friend’s class next door and am going to try that next week. I am sure i am driving the special-ed teacher crazy. He comes in for three different classes, and just rearranging the seating chart has thrown him for a loop enough. LOL I have found that this is also helping me get to know the students’ names since I am looking at them in different places. I would definitely recommend giving this a try in a talkative class situation. Just be sure and follow through with the punishment so students understand the consequences. BTW, my daughter is a secondary history major who doesn’t like this idea. lol Says it just seems like it might violate a confidentiality issue. I say it’s no more than continually telling a student to be quiet. As a matter of fact, it’s much less intrusive to the classroom environment! When your daughter has a class of her own someday, she will “get it”! Kind of like getting parenting advice from someone who has no children. Hope things have been going better! Yes, I know some people have a natural hesitancy to use this method. 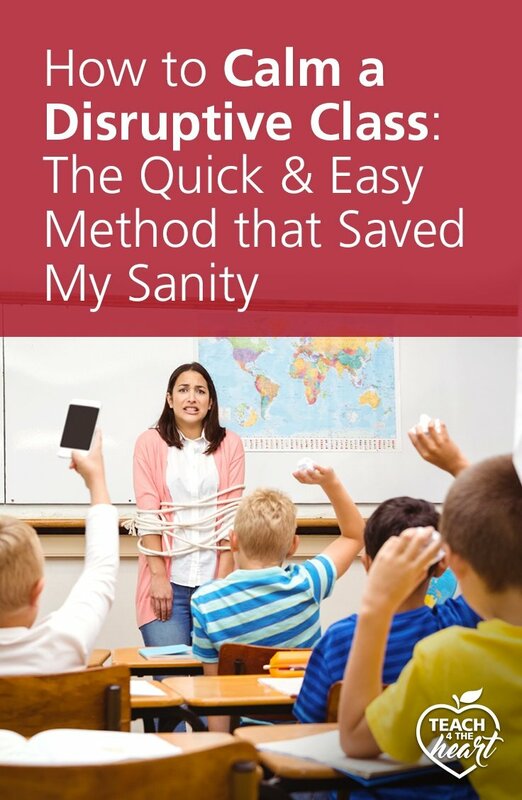 I did too at first, but it works wonders and is actually better for the kids because 1) the classroom is more controlled and 2) they normally don’t end up receiving any actual punishments. I think sometimes we are too concerned about kids’ self-esteem. Of course we should never demean a child, but if they’re not following our rules, it’s okay to call them on it. It’s ultimately for their good. I still have a few who insist on acting like fools, but I’m working with them on self-control so hoping the detention assignments will be a thing of the past soon. Do you have any advice for a sub who does not often know the names of the students? This method has worked well for me on the rare times that I have subbed two or three consecutive days, or if the teacher has left seating charts and the students are in the correct seats, but otherwise it is very hard to use this method. Actually for subbing I would reverse that – start the day/morning/class with each child having a certain number of sticky notes. When you need to remind someone to follow a certain expectation, remove a sticky note. Students at the end of a day/morning/class with remaining sticky notes can then enjoy something, or students missing a certain number might end up with a particular consequence. If you GIVE a sticky note as a reminder to follow a rule, that sticky might disappear before you have a chance to follow through on it. You can also have a special hole punch or ink stamp that you use to ‘mark’ the sticky notes of those kids going above and beyond. When i was a sub, as I called roll, I would make a seating chart so I knew where everyone was in the class. Then I was able to call on them by name and also write their name on the board if need be. It worked great! Rarely had any problems with the kids. I would use the post-it idea. Just put a post-it in front of them and have them write their name. When I was a sub I would write the number 10 on the board. When students started talking, I would erase the 10 and write 9, without saying a word. When it got to 7 or 8 kids would ask what I was doing. I would respectfully tell them I was planning on giving them 10 minutes at the end of the class to talk to each other. At that point they would start policing each other. If they had a period of being focused, I would walk over and erase the number and pause long enough for one of them to complain that they were being “good”. I would let them know that was the expectation and they got a minute back. If they could continue to be good they might earn it all back. They typically had about 5 to 6 minutes to talk (the time they would have anyway), but they earned it and the classroom was a lot less hectic. As a sub of 6 years, with prior teaching experience (key “experience”) I find it is Critical to MAKE a seating chart the minute I walk into a room without one. I tell the class “I am a TEACHER. Please note – I am grading each of you – on this seating chart. Your teacher may or may not choose to use this grade. But I ALWAYS used the sub notes as a grade, just to let her know how your did in class today. He/she can use it however they see fit.” Then I would note talkers on it. They rarely give me the wrong name when I say this, it takes a little time at the beginning, but well worth it & I can call out warning by name if needed. I also say in warning, “I wrote you down. If you can change your behavior, I can change my note/my mind.” This gives kids a change to redirect themselves. As a sub I learned to make a seating chart of my own quickly as i called roll at beginning of class with eye contact. each day and very few problems. I have a blog post people seem to enjoy on different ways to settle a class http://eslcarissa.blogspot.mx/2013/04/10-classroom-management-techniques.html I am shocked 1. that I forgot about this, 2. That no one else has commented with it. This was a big winner for many substitute teachers I had growing up! Linda, thank you so much. Love these suggestions and will implement it in my classroom. I’m not sure if the book on Assertive Discipline in the Classroom by the Canter’s is mentioned anyplace in this site, but would suggest it too. The crux of the above successes is being assertive with your students. Linda – great to see you for a moment this morning in church. This looks like a delightful site. I’ll mention it to other colleagues here at PCC. Thanks! And thanks for sharing that resource – I’d forgotten about that one! Thamk you. I would like you to help me please by an exchange of rmails. There is a terrible attitude among my students towards school snd myself. Depends on whether your administration and parents would support it. Many of our parents would be upset from the humiliation of it by doing something like that in front of the other students. Absurd I know but sad to say so many school administrators don’t want to upset parents these days…. Oh no, that’s not absurd at all. It’s how it works now, many school authorities don’t want to have troubles with parents. I think the tech savvy version of this is ClassDojo http://www.classdojo.com. It might take care of the juvenile aspect a bit because its techie and it uses avatars for the students. Also you can get a printable report to give the teacher or administration and notice trends, such as which classes are having behavior issues or which students are repeat offenders. You can also add in bonus points for positive behaviors. Yes, I’ve heard a lot about ClassDojo! Sounds like it can be an excellent system! Thanks for sharing it. In my opinion, it is a practical idea which I will try in my class, thank you! I use class dojo the same way. You can give the kids a number so it is not their name posted. I have found this to be very effective. I also use The Circle…! When the class are failing to stop talking and give me their attention, and I am just too weary to start clapping or calling for their attention, I go over to the board and start drawing a circle. If it joins up, they lose a minute of their play. There are several good things about this: firstly, I can take as long as I like to draw the circle. Second, once the children get used to it, they start urgently shushing each other as soon as I pick up the board marker. I can also choose to except some children from the class punishment (which is always a last resort). At my last school I only joined the circle once; in the most difficult Supply job I had, I drew about 4 circles in a row but it worked and I got the class under control. I wrote the cumulative minutes lost on the middle of each circle. Basically, it works because I rarely have to follow through with the sanction! I teach middle school and I use this method. However, instead of writing the names on the board, I hand the students a clipboard and have them sign their name. I completely forgot about using a clipboard. I like this idea and will implement it in my class. Thanks for sharing. I taught 9th grade English for eight years. I used this method, and it worked beautifully! The only thing with class dojo, is you have to keep it projected on a screen/board so they can see it. Unfortunately my smart board is not presently useable. Gain SS attention by doing your classes interesting enough. Talk to the leader and persuade her or him to pay attention to classes. Explain the benefits of being well-educated and knowledgeable in this real world. I always do that and I have never had problems of discipline with my SS. I was taught that we should treat SS as human beings rather than robots. Humanistic Approach. Teach your SS that is not easy to be there for them. I do this, but have been running into some issues. I’m not always able to get to the board without stopping my lesson. I’m a music teacher and am often demonstrating things on instruments or modeling something I want the students to do, so it can become a disruption. Also, as a teacher new to this urban middle school, I often am met with a “that’s not fair because everyone else is talking” response. Any advice?? As for getting to the board without stopping your lesson, that can be challenging, but what you want to try to do is just keep talking (or singing or whatever you’re doing) as you walk to the board and write down the name. If you can’t at that moment, maybe come up with some sort of modification. Maybe just say, “Elizabeth, that’s a warning” and then write it down when you have a moment…..Hope that helps…. Oh I have to add one more thing….Another great way to respond is just to say, “You’re not in trouble. It’s just a warning.” This normally helps lower defenses & help them realize it’s not the end of the world…. while still maintaining that they ARE receiving a warning and need to change their behavior. I have sung whatever needed to be said, in the tune of whatever we were singing– for example “Billy needs to sit down”. what about younger grades, like second grade? I would use names on the board or post-it notes for 2nd grade. Or have a place on their desk where you write a check with a dry-erase marker or something like that. Ok, somehow I was not able to finish that statement. So when kids come to my room with such a lack of self control it takes up a lot of time taking names and then dealing with the crying. So classroom teachers …please raise your expectations. Tried this and got results but then was chastised by my administration because we use PBIS. Can’t win! We use pbis too and still do this- I’ll pass out our pbis points to in task students first. Then initials on board for kids who didn’t get the hint. My major issue is that I have very few consequences available. We aren’t allowed to take away recess bc wellness policy, there is no late bus for after school detention, and I’m firmly against taking up my duty free lunch break for discipline- I’m a bear in the afternoon if I don’t have that alone time. I think what I struggle with most is coming up with viable consequences to be used if necessary. I think our school policy is something like warning, call home, referral to the office. To me, that just seems like we’re passing the buck to someone else and makes us as teachers look weak and ineffective, like we need someone else to solve our problems for us. But I’m not sure what else to do for a consequence. I did see the ideas listed about taking away play time and giving extra homework, but at the middle school level, the only free time we have is lunch time, and I think following through on extra homework is difficult. I’d love some ideas for consequences! Hi , I am struggling too , I don’t know how to describe the disaster I am in , I am trying to find a consequence that is influencung the student. I thought of preventing him from going to solve exercises on the board for one day or preventing him from going to the bathroom for two days . I applied it and it was 20% effective. Thank you for the tips. I just started my first year teaching. Many of my students come from troubled homes, and a majority of their parents work at the chicken processing plant–the only major industry. Working at the plant is what they aspire to if they have aspirations at all. I am struggling tremendously with controlling the classroom. Bad grades, turned lights, threats of detention–they simply do not care. I too would like some ideas for consequences. I do not have a smart board and my classroom is too large for all students to see the white board. (It’s not that board is too far, the problem is parents either can’t/won’t buy their kids glasses/contacts or the kids won’t wear them) Suggestions? Ha! This reminds me of the Louis Sachar book, Sideways Stories from Wayside School where the teacher writes the child’s name on the board under the word “discipline” when they break the rules. If they do it again, there is a check after their name. The third time and they go home early on the kindergarten bus! I read the book to my class at the beginning of the year, and sometimes do the “discipline” trick after that. Too bad we have all-day kindergarten at my school! This does get their attention. Thank you all, for the advise. Wow, thanks for this! I will be trying this on Monday. I’m hoping to see the wonders this can make hehe 🙂 Thanks a lot! Great advice. Yelling only temporarily works. They need to see consequences and consistency. Something that works for me is to put the names of the children who are cooperating on the board instead of those who aren’t (I teach elementary so you would have to try it with middle schoolers to see if it is as effective.). This way those who are doing the right thing are getting the attention. Then when I need someone to run an errand or do a job I pick a name from the board. I also come up with other rewards that I find motivating for my students. The trick is to find an occasion for getting even your naughtiest student’s name up on that board (look for the reason, you’ll find it!). Once they have a taste of being one of the “good kids”, they are usually much more cooperative. I try to do this with everything: notice good behavior and reward it in some way, even by just thanking the student. I find that I rarely have to address inappropriate behavior because once everyone knows that those who behave get the attention, behavior issues decrease dramatically. Additionally, for you, as the teacher, this puts a much more positive spin on your day and a more positive atmosphere in your classroom. You have the job of noticing and rewarding the good stuff instead of always being on the defensive! I have been teaching for 20 years, am a quiet person, and never imagined classroom management would be my strong suit-go figure! Anyway, try it; it works! I’ve modified this idea. I use a red marker as my warning- your name + 2 check marks in red = detention. I also use a blue marker to recognize students who are doing what they’re supposed to do. It’s the same idea- name + 2 check marks in blue = reward (small piece of candy for example) at the end of class. I teach 6th grade at a Title 1 school and my students have responded well to this. I’ve tried Class Dojo and it didn’t work as well. For one, choosing what to award points for makes an extra step in the process that takes longer. Also, I always had to have my iPad in hand and couldn’t do anything else on my computer. The names on the board works a lot better. It’s some extra work on my part to keep up with, but until my kids can monitor their own behavior this is what works to keep them under control. Another note- my kids’ favorite reward to work for is lunch with me (only requires me giving up time, no money)! I’m from Buenos Aires, Argentina. I’ve tried this many times but it seems that my reality is totally different from yours. I’ve even tried to have a special board where I would write all the names (because, in a certain point, all of the 30 students appeared in that list). So, I thought that strategy was useless for me. I’m trying out other things: for little children I sing, for teenagers I start talking about the exams (and sometimes giving out key questions) but in a ver loud voice, and with adults: I simply remind them that they had paid way too much to be wasting their time talking and disrupting. Argentina is a very special place, people have a lot of energy and, sometimes, very little respect of authority. Imagine your most terrible course, that’s an easy one here, and let’s not talk about public schools in shanty towns… those are for really brave teachers. I frequently read your post and It shows that you know A LOT. But sometimes I feel this is not my place… or that I have to adapt things too much. If you ever have the chance, come to Latin America, and feel what is like to be in a really rowdy class. Thanks for sharing your situation. I can only imagine how challenging that must be. You are absolutely right that I haven’t experienced the worst situations – all I can do is share what’s helped me or others I know in the hopes it will help others. One thing to keep in mind is that none of these strategies really work in isolation. It has to be a combination or a whole lot of factors to really see long-term change. 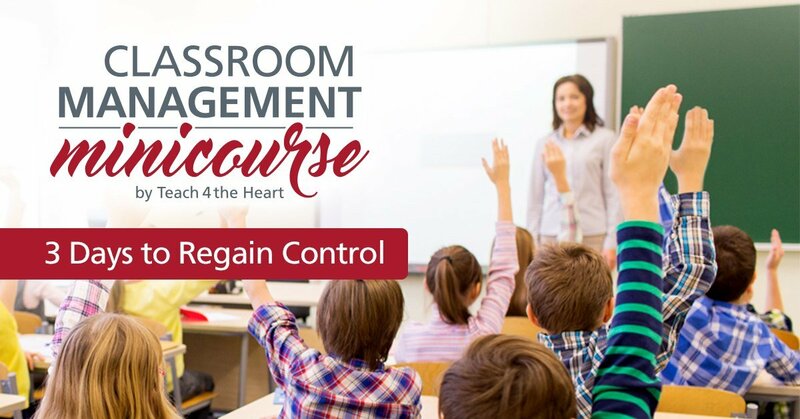 That’s why I created Classroom Management 101 – to try to put all the pieces together in one place so teachers can make holistic changes and see real results. I’d love to visit international schools at some point. That would be such an eye-opening experience I am sure! Hi Heather, I am a full supporter of keipeng blogs open. In fact, all that I do in my class is open all blogs, wikis, voicethreads, wallwishers etc. By doing so, I have had to teach cyber safety constantly (and this is almost a daily/weekly session as we all need constant reminding of this). However, by keipeng our blogs open, students have an authentic audience, have collected many dots on their clustrmaps, gained some wonderful comments and feedback, been highly motivated to write well and present an attractive blog etc. One real success story has been that of edw.ooo2.globalstudent.org.au/2009/10/11what-makes-a-good-teacher/ In this post, Rachael added a link to her text movie that she had made on what makes a good teacher . She tagged it with those exact words and ended up getting a comment from a professor at a university in the USA stating that she was going to show her teacher education students, Rachael’s post so that they could see what a young student liked. (At this stage the comments have disappeared with the reformatting of edublogs, so will need to try and help her display them again.) How motivating and valuable is that for young students! I teach music, and this idea was given to me by a colleague: I write the word “MUSIC” on the board. If they keep talking over me I silently stand up, take the eraser, and erase the C. If I have to erase C and I they start losing recess time. (The teachers will make them walk in circles around the blacktop instead of standing on a wall–the kids do not care for it and will avoid it!). It is at the point where I can just pick up the eraser and they will shush each other. Also, many of the homeroom teachers in the upper grades (3-5) will send behavior charts to class. I can easily silence a class by just picking up the chart and dramatically clicking my pen. If that doesn’t work, I will tell them what I’m marking for and how many without naming specific children ( ex. “oh man, that’s two people marked for talking out of turn”). I do this with my class but rather than using the bell I will say loudly “everyone listening in 3…” And raise my hand in the air with 3 fingers raised. I will count down and after one I will say in a conversation voice “everyone listening” and write down the names of anyone still talking. This gives them time to finish their conversation or whatever else they are doing and if they don’t hear me the first time, someone else will and warn them for me by the time I get to 1. The name on the board just means a quick chat after class about why it is important to listen while I am speaking and if their name ends up on the board again there will be further consequences. So far there have been no regular offenders. Thank you for this! I started it last week, in the middle of the week, with my very rambunctious 6th graders. It is truly working. I tweaked it to fit my classroom and the kids now know if I make it to the board, it’s time to stop talking. I love softball/baseball so mine is a strike system. It is not just for talking but since that it what usually leads to inappropriate classroom behavior, that is where it starts. Also, as with a game, their strikes go away at the end of the class. They get to start over the next day. One student suggested rewarding the good behavior with a home run list and I will be getting that ready to implement over spring break as I want to include prizes. I am very proud of my students because they are taking ownership and responsibility for their behavior after just 3 days of implementing this. Again, thank you! I was at my wit’s end when I came across your blog on Pinterest and now I feel like there’s a chance to make it without losing my mind, lol! So glad to hear it’s working so well for you! Nice tip on calling out the first person who is disruptive. Nobody wants to be called out or embarrassed. It is much more difficult to calm an entire class that has escalated. The goal isn’t to embarrass them though. Just to show that you mean what you say. I do something similar but opposite. If the student sees their name it’s because they’re doing something good. Students who don’t see their name receive consequences. I made a chart with their names with Velcro. I teach 5th primary in an English/Spanish bilingual school in Mexico. I have third graders who say things like, “Who cares?”/ “I don’t even care” because even if I do follow through on a phone call home, or a referral to the dean, or 5 minutes off free time, etc. after the 3 warning system, there’s no TRUE follow through. Parents don’t follow up, and they know that they can get away with disrespect, ignoring my directions, and being little….jerks. The system is broken and I am just another teacher who makes threats that yes, I follow through on…but no one else does anything. I actually feel so upset and typically cry twice a day. I never dreamed that the extreme disrespect and general out of control nature of my students would make me question myself. I pray everyday that June comes quickly. That’s so tough! Are there any teachers in your school who seem to somehow make it work & whose students are surprisingly engaged? I would seek them out and ask them what you’re doing. When you’re in a tough situation like yours you have to adapt new strategies – and someone in your school that’s making it work would have some great insight for what works in your situation. Exactly the same here! They didn’t care because they knew I couldn’t do anything to them really. Additional assignment – they wouldn’t do it, phone call to parents – they didn’t care, detention – they wouldn’t stay, send them to the principal – they wouldn’t go, ask them to leave the class – the wouldn’t leave. I tried so hard with all my time, money and attention. Eventually gave up teaching when they smashed my laptop. I guess not everybody can be a teacher. Biggest failure of my life. A grown-up bullied by children – quite pathetic the feeling. Read so many books (on victimisation as well), asked and received so much advice from wise and professional people and I still don’t know how to get that minimum respect. I admire and envy you successful teachers. You have the skills that proved unreachable to me. And proved the hard way. Had to resign from class teaching despite it had been my dream job and a real vocation. Couldn’t get any respect or attention from the kids no matter what technique (and time, and money, and research, and imagination) applied. They would just ignore. I don’t mean all of them, of course, but even one or two kids screaming and running around is enough to make the lesson impossible. Ended up teaching individually only. Keeping control of a group is an incredible skill. My applause to you teachers! I’m sorry you had such a tough time, Amy. Just as word of encouragement -for many, this is a skill that takes quite awhile to master. Even with the best advice and mentorship, it can take a year or two (or more) to really start figuring it out. I am with you. I think that there are certain demographics that simply do not lend themselves to allowing teachers to succeed in meaningful teaching. For the author, they were fortunate. I experienced the same. No real consequences. Get out while you still have your sanity. Sure, many of the class is on board with learning, but they have been robbed by inaction on the part of the administration. Allow your teachers to slowly die of stress, as you retain the “poor” kid. The strategies outlined by the author CAN work, and DID work for me for many years – until I had to switch schools. But you may be in the WRONG school. Why do you think of punishment only? I don’t at all. 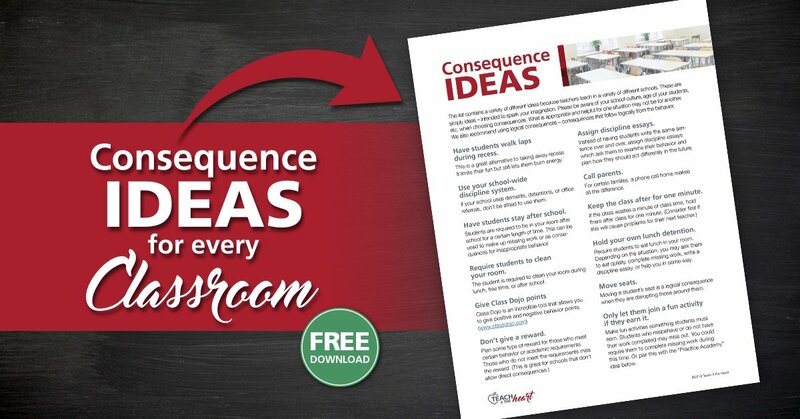 This is just one strategy that goes together with a whole classroom management plan that includes lots of elements. Also – if you notice, this strategy is not really about punishment at all. It’s about helping students self-correct with warnings so that they avoid consequences. I hardly ever had to actually give consequences when I used this strategy. tell me how maintain discipline in class..
each and every students loud voice…. I did a few years as a supply (I believe you call it substitute) teacher, and remembering names always causes issues. I used to play a game first thing in the morning, where pupils use an adjective that begins with the same letter as their first name eg. caring Corey, happy Hannah etc. This starts with the first child, then the second has to repeat that plus their own, the third repeats both before adding their own and so on. At the end, it was my challenge to go around the whole class naming each. It took about 15-20 minutes, but they were all fully engaged and appreciated when I remembered them individually. Its surprising how easy it is to remember all their names, and it enabled me to write their names on the board as a warning, as discussed here, confident I had the right child. It was a quick and effective way of building a relationship with the class, which as a supply, is often difficult to do! I would never publicly humiliate a child by writing his/her name on the board. This would trigger some kids. For others it establishes that your classroom is not a safe space to make mistakes because the teacher will embarrass you. It erodes their relationship with you and sets up a power struggle where there doesn’t need to be one. Preventive strategies, such as a signal for attention and pulling frequently rowdy students into the hall before class to privately discuss things is much more effective and it doesn’t damage your positive relationship with students. Our job is to reduce and deescalate conflict not to create or worsen it. Students need to be corrected in a developmentally appropriate, sensitive way. Catching them and publicly shaming them is NOT ok. Teaching them the skills they lack (impulse control, social politeness, etc) will go further toward eliminating the problem long term. Always give a child the opportunity to save face. No one should be publicly berated. In most classrooms, this is possible. In the particular school I taught at (and resigned after 4 weeks) it will not work. There are multiple students that won’t stop their loud disruptions despite going through the merry-go-round of being redirected, taking a time out, going to a buddy room, filling out an “I’m so sorry” paper, seeing the behavioral specialist, being suspended for violence, and knowing full well they will never be expelled (because they “been there, done that” last year too!). However, for the other 8 years of my teaching to middle schoolers in “normalish” schools, yes. It can help. Yes, I agree; this doesn’t work. I’m sorry, but it was almost funny to read what she thought was answer. This is a strategy that personally helped me & has helped a lot of teachers as well, but it depends on your situation. If you’re in a particularly difficult situation and have tried a method like this without success, I recommend finding a teacher in your school who IS making it work & ask them what they’re doing. In many states it is illegal to put a child’s name on the board for behavior reasons. I don’t agree with this at all. Every school / district / state is different, so find a method that works for your situation. See the bottom of the post for alternate ways to use this method without writing names on the board. I’m currently subbing pre-k to 12th grade and it has it’s struggles. The district I work for in Southern California, doesn’t give any training, so I’ve had to learn on my own! It’s had its challenges, especially when middle and high school teachers don’t leave any discipline guidelines for their classroom. Younger grades are easier, but it doesn’t work the same for the older ones! So thank you for this! I will definitely give this a try! I don’t plan on staying long-term, but I need something to keep me sane in the mean time! lol Thank you!!!! Just got placed in a classroom of 6th graders in the middle of the semester because their teacher suddenly quit. The students have had about 10 subs in the past 4 months. They are disruptive, cuss in teachers faces, get up and do what they want, leave the classroom (this was the first 2 days). I tried detention and calling parents, the students are used to getting their parents called and don’t mind getting detention so they tell me to go ahead and do it. I called some parents, one parent cussed me out and others tell me they don’t know what to do either. Still figuring out ways to deal. Writing their names on the board is counterproductive, they actually cheer each other on when they get a check mark (I try not to laugh). Such is life at the moment. I teach high school and I use a warning card. I let the students know that it works just like on the soccer field. I keep 4 cards on my desk (I’ve never needed more than 3) if someone is talking (the most common offense) I take a card from my desk and place it on theirs, this works well and doesn’t draw much attention because I’m one of those teachers that is generally moving around the room. After the first couple of weeks, I rarely have to resort to calling them out. As they leave the classroom, they give me back the card, I thank them for cooperating for the rest of the class period. When a student that often gets a card, makes it through an entire period without a warning, as they are leaving the class I make a point of smiling and telling them I appreciated their participation today. The last part is important. It provides positive attention to those students who are attention seekers, and reinforces the others who are trying to make a change. Thank you a lot, Ms. Linda! I have been suffering with my new students for about a week. They were very chaotic. They didn’t listen to me nor did they obey my orders. The whole class was a mess. I tried the calm talkative ways. That didn’t work. I tried shouting at them and pounding on the table. That didn’t work either. But, when I read your article and applied your technique, it worked like a charm! Of course, two or three students got their names written, but all in all, I was able to establish order in the class using this method! First, I find it sad that teachers are cutting down and criticizing other teachers. With that said, I am a 30 yr. Teacher, thought I had an excellent behavior system, proud of my teaching, until I was displaced to a school in which students are economically deprived, single parents, no parents, or parents working 2-3 jobs. My students are out of control tell. I tried my ( your) system, but can rarely get past step 2. Once a name is written students start arguing loudly, “what did I do?, I wasn’t doing anything, that’s lame everyone else is talking, etc.” In fact the entire class joins in on that students side. I’ve never experienced this before, and I’m stuck with 3 unruly classes that behave worse when I try to implement the plan. They talk out, talk to each other, and writing their name is a joke to them. I’ve gotten to the steps of office referral, but it has no effect, and the day is ruined, and the behaviors don’t change. I have always been proud of my classroom management and ability to teach. I feel like a failure now, I don’t get through my lessons, and I wonder if there will be any solution to the disruptive behavior. It’s been suggested I start setting up centers, let them move, and not stress about the noise. Any suggestions?